I tried renaming tags today and ran into an issue. Just does not work. 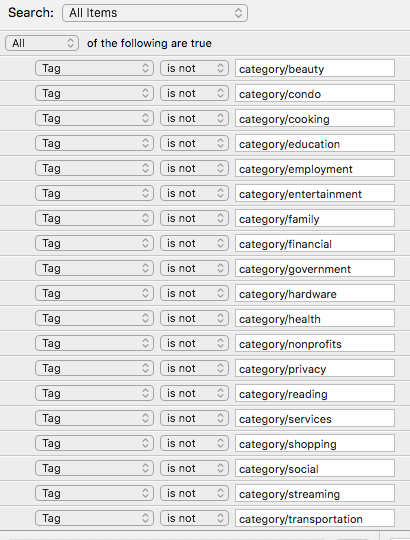 Example: nested tag "category/cooking". Tried to rename to "category/food" using the right click over tag name and typing in new tag name, then pressing enter to complete. It looks like the tag has been changed until TAGS is minimized or 1PW is closed. Expand TAGS again, or reopen 1PW, "food" still appears as "cooking". Indeed, there's an issue with that which we're working to address in 7.2.5. It shouldn't be long, if all goes well in testing. does this bug also affect Smart Folder renaming? I noticed the same behavior there as well plus some other issues (so far unreproducible so I haven't yet reported it) with Smart Folder editing and modifications. @Superfandominatrix: Ha! I believe you. The search here isn't great though. Sorry! It's possible. The Smart Folders code is super old. There may be some unexpected interaction with stuff that didn't even exist back then. Are you using only local vaults, or do you also have (a) 1Password account(s)? @brenty I have two local vaults configured with Dropbox sync. No 1password.com account. I use Smart Folders heavily to ensure tags are updated correctly. Which account has my address, a timezone, or maybe nothing at all. Same for phone numbers, email addresses, and security details like two-factor, etc. At one point recently naming and renaming SFs worked correctly. I purchased 1PW7 for Mac November 2018 and I am fairly certain I created a SF since then and named it something other than "Smart Folder". As of this posting, I can create a new SF but I can not assign a name other than "Smart Folder" to the new SF. Attempting to rename the new SF also fails. You can see two test SFs at the bottom of this screen print. They were created in the last two days or so. I use Smart Folders heavily to ensure tags are updated correctly. I'm not sure what this means. Can you elaborate? @brenty I use 1PW tagging to identify which personal information is known by a specific service. So for example, my current vault contains 310 items. If you look at the screen print above, and see "QA address" with a value of 3, out of the 310 items only 3 items have no address tag. In theory, "QA address" should have a value of zero once the 3 items have the right address tag added to it. This next screen shot shows how I build a QA query using category tags as an example. The other QAs have personal info in them so for privacy I don't want to share those. In comparison to this category QA smart folder, the "QA address" SF has 25 tag criteria that are configured in the same way as QA category example I've provided. The reason I've done this is that I've moved a lot, and I have addresses associated with residency in a foreign country. When I have some sort of change event in my life, I can zero in on only those services affected by a move or other change. Means I don't have to go through all 310 items in my vault to figure out what needs to be updated, I just look at the tags, and if I moved home I only need to updated 87 items with the tag "address/home". I'll check the beta in a bit and get back with observations. A quick general play around with Smart Folders did not reproduce the wonky stuff I saw with the earlier production version of 1PW. Example of wonkiness included not seeing the Cancel / Save buttons during modification, during modification the entire criteria definition area was a gray expanse equal to the area that the SF criteria definition should occupy. I was not able to reproduce either of these wonky behaviors with the earlier version for summarizing in a post but user experience in the SF area was just not smooth. The beta version seems smoother on the surface. @Superfandominatrix - excellent! Keep an eye on things, and let us know what you discover. Let me know when this problem is resolved. I have the same issue on my imac. If you'd like me to try a beta version I can do that. @anibal - we don't keep lists of users to notify specifically about new featurea or bug fixes. But as noted by earlier posters in this thread as well as by us, this issue has been addressed in beta. If you'd like to try it now, click "Include Beta builds" in Preferences > Updates.